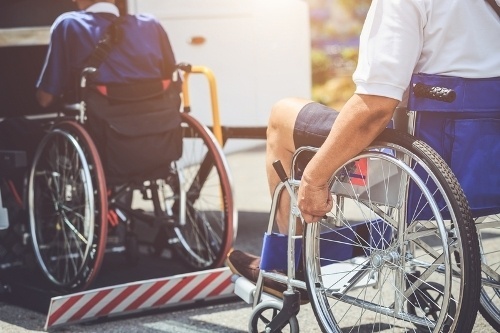 The primary purpose of getting the best wheelchair ramps for stairs is to have a safe way for disabled, elderly or handicapped individuals to go down and up easily. 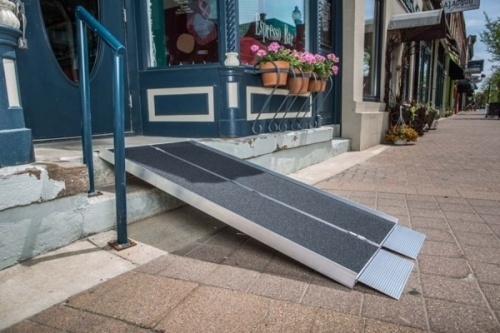 These wheelchair ramps are usually used over curbs and stairs, and enable people who use wheelchairs to move around homes safely, businesses, and other areas. 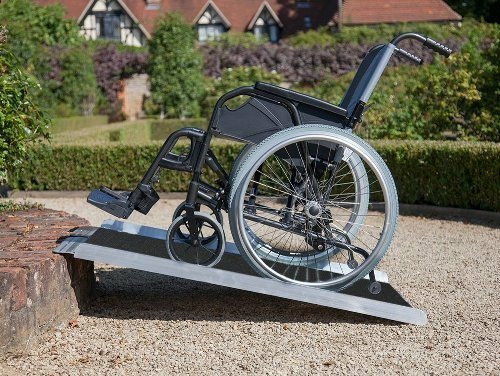 Read our reviews of our top 10 ramps followed by the buying guide below to make it easier for you to decide. However, for those who wish to jump straight to the final verdict, here is a quick recap on our top picks. However, it is important to note that the positions are in no particular order of importance. Some models may be preferred by others, therefore, please do read in details, which models may suit you the best. 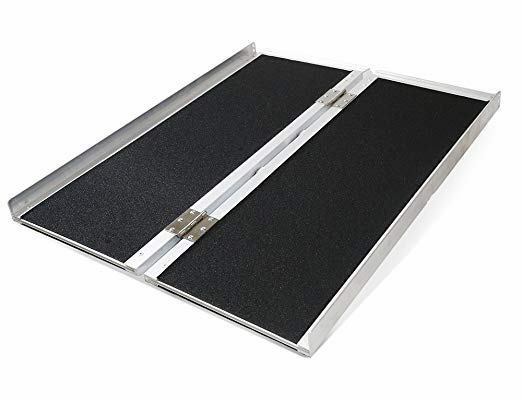 Recommended Height Lift: 6" - 10"
Prairie WCR630 is a portable and lightweight wheelchair ramp made of aluminum that can be folded conveniently to a quarter of its size when opened for easy storage and carrying. The ramp has a handle and can be carried like a suitcase. 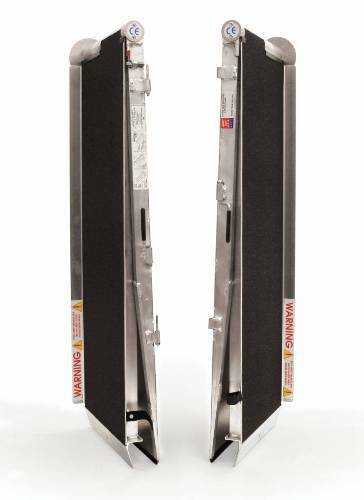 It has a patented center joint hinge which is not present to other folding ramps. 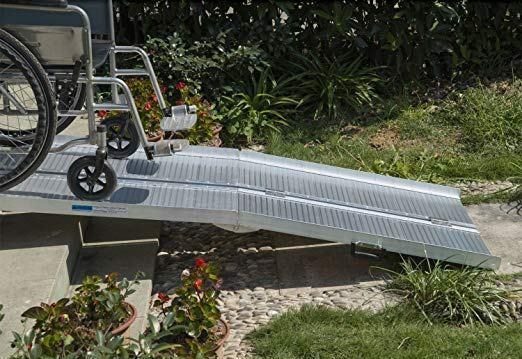 This model is considered to be one of the best portable wheelchair ramp for stairs. 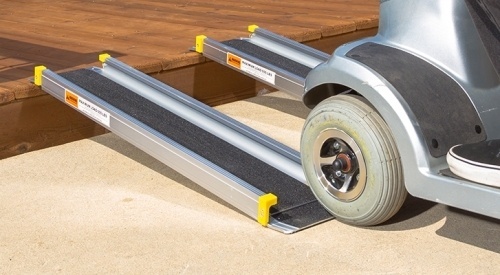 To make it more durable, the ramp is welded, and the walking area has anti-slip traction tape and offers the best traction even when the wheels or ramp of a chair are wet. The Prairie Ramp has passed the safety test and is listed by Underwriters Laboratories, Inc. This assures the users that it can deliver what is made for. It is 30 inches in width and designed to handle any wheel configuration of scooter or wheelchair. To determine if the ramp is on a safe slope before using it, a visual aid is attached. 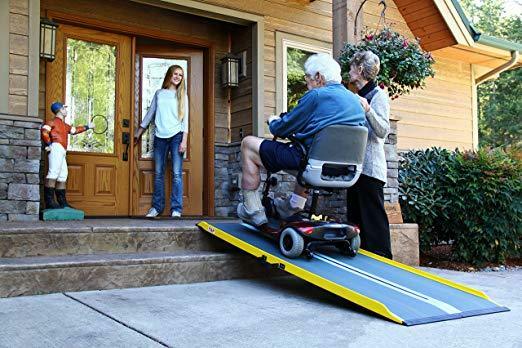 If you are looking for portable wheelchair ramps for stairs, the Drive Medical Single Ramp is a good option. Included in the package is a carry bag equipped with a handle. You can fold and carry it with you easily. 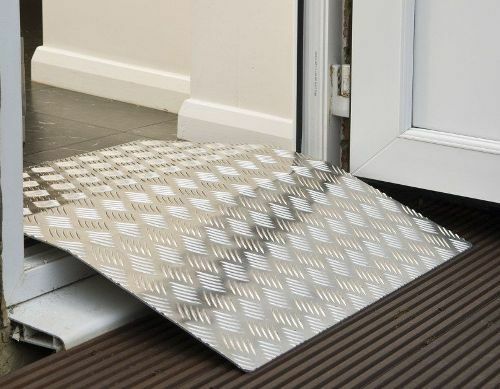 This is a very durable ramp made of a good quality material that protects it from damage - like perforated slots on the ramp surface that lets the water drains out. So if you left it outside in the rain, the water will not fill up the ramp and sustain water damage. The Titan Wheelchair Ram is sleek and efficient. It can carry up to 600 lbs. of weight. To make sure the wheelchair will not slip, it has a slip-resistant surface. The ramp is made of aluminum and is a bit heavier than others which is about 40 lbs. 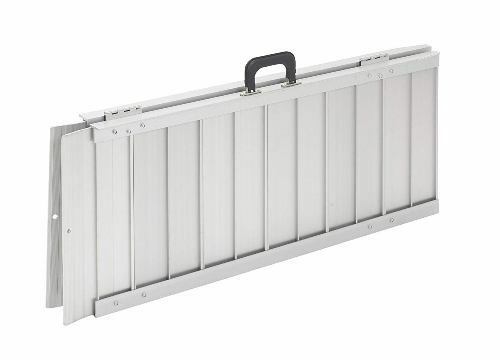 It is a six-foot-long ramp with excellent flexibility for easy placement and can be used in any situations. The angled lip is 2.5 inches with holes to secure the ramp in position. With its soft nylon handle, carrying it is not a problem at all. In spite of its length, it is very easy to carry around. 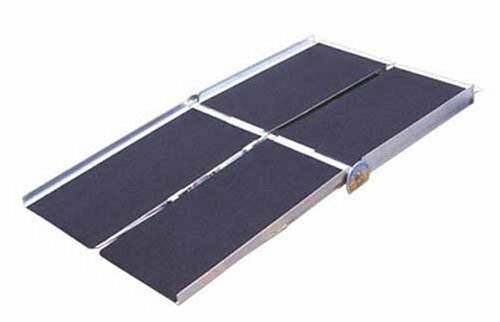 Folds: 40" x 14.5" x 8"
DMI wheelchair ramp is an affordable portable ramp and made of aluminum. The best thing about portable wheelchair ramps is that you can adjust the length from 3 ft. to 5ft. by push and lock system. 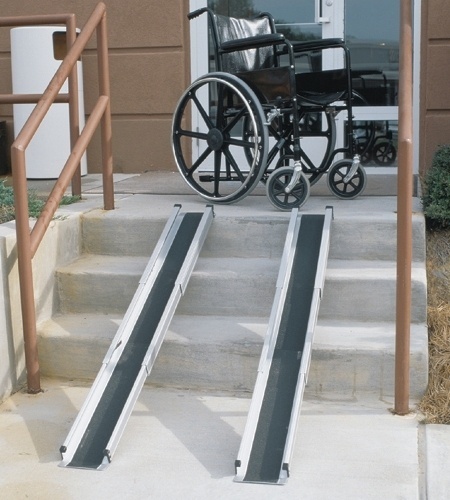 This makes DMI wheelchair ramp easy and convenient to use. 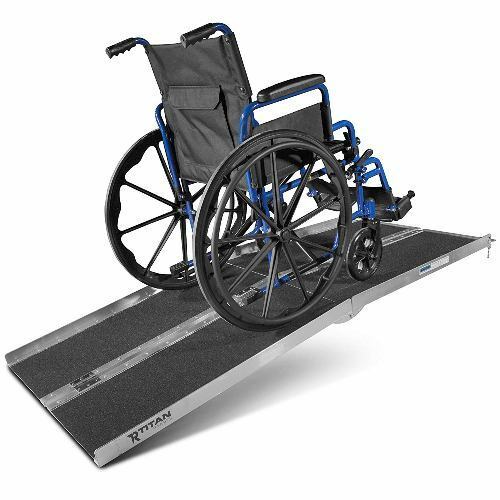 DMI ramp has telescopic and retractability feature that makes it even more helpful to disabled people. It has a width that measures around 4.5 inches on the inside and 2.25 inches high which makes it safe enough to prevent accidental side falls. This aluminum wheelchair ramp can support chairs and their users up to 600 lbs. It is 36 inches long, which makes it ideal for getting inside your house or small businesses. Clevr 3’ is recommended for height rises of 6 inches or less for safety, but this is best suited for different situations. 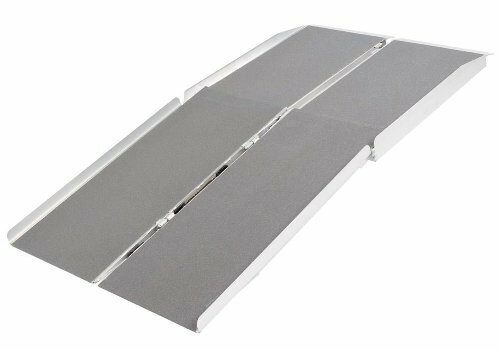 This portable ramp has a high traction feature which is perfect for electric and traditional wheelchairs. For ease of transport, it has a carrying handle and is foldable. It is lightweight and weighs around less than 20 lbs. 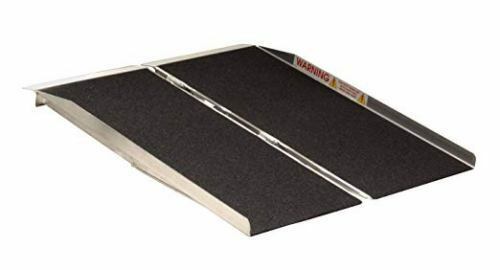 For those who are in need of a small easy to use the ramp, the Clevr 36 inch ramp is a good option. This wheelchair ramp is designed for curbs, traversing steps and raised areas. For easy storage and portability, you can easily fold it. It comes with a built-in carrying handle for convenient transport. Also, it has a slip-resistant high traction ramp for the user’s safety. This will keep you protected against slipping and falling. The ramp has rust-free aluminum construction that can accommodate up to 600 pounds and is welded properly to assure durability. WCMF-5 has a dimension of 5-feet and 30 inches width, weighs 14.4 lbs. Because it is lightweight and easy to assemble many users love this brand. For walkers this ramp can be helpful for transferring to places as high as 15” but for scooters or wheelchair, 10 inches is the maximum rise. This is yet another great product from Prairie. 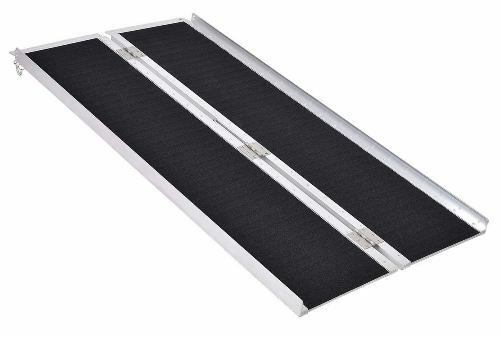 The SFW330 is an easy to carry ramp that is available in various lengths. The ramp’s width is 30 inches and can handle any wheelchairs make sure their width is not more than 30 inches wide from wheel to wheel. It is quite a stable ramp, which can handle weight up to 800 lbs. As compared to other ramps, this wheelchair ramp is welded instead of riveted which makes it stronger and best for heavier individuals or wheelchairs. For ease of carrying, it is equipped with a handle. The Prairie SFW330 has skid resistant, anti-slip surface to avoid possible accidents. It is a bit heavier than other brands, but its sturdiness and usefulness are worth a few extra weight. 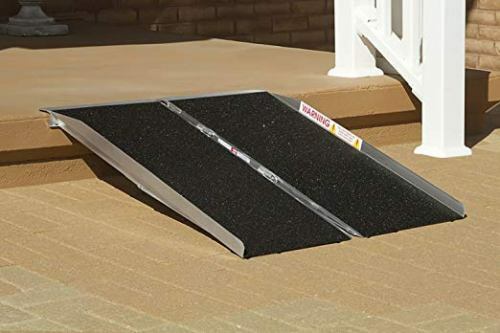 One of the main factors that you should be looking for when choosing a portable handicap ramp for stairs is the non-slip feature. It has guardrails on each side to prevent you from getting into the edges in case you are not appropriately aligned. The ramp is designed not just for wheelchairs but for scooter and other bulky items that might not be moved using the stairs. When it comes to construction, it is made of the durable aluminum frame which is anti-corrosive and is the best tool for many years to come. Also, it comes with a handle so you can transport it easily. The ramp is comfortable and convenient to use. The dimension of the ramp is big enough and very sturdy that it supports up to 600 lbs. making it a good option for many people. As a whole, it is an excellent equipment which enables an area to become easily accessible for those with physical disabilities. More is better is the situation with GoPlus Multi-Fold Ramp. You can decide between the 5 x 30 or the 3 x 30, whichever fits you. The ramp is designed for sidewalks, curbs, and steps. If you are done using it, fold it and grab the handle and you are off to go. The ramp is perfect for best hold in any weather conditions. It has a solid traction surface. 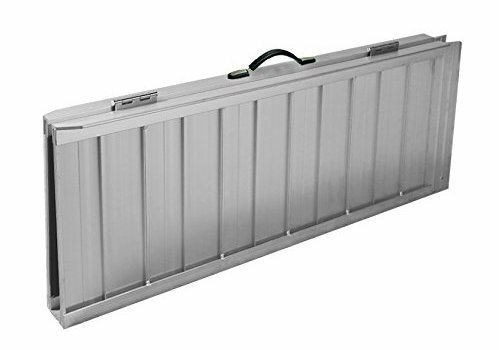 The GoPlus aluminum design is sturdy and can accommodate up to 600 lbs. It is also waterproof, which makes the product last longer. You also have the option to install the ramp permanently so you can roll the wheelchair easily and safely. 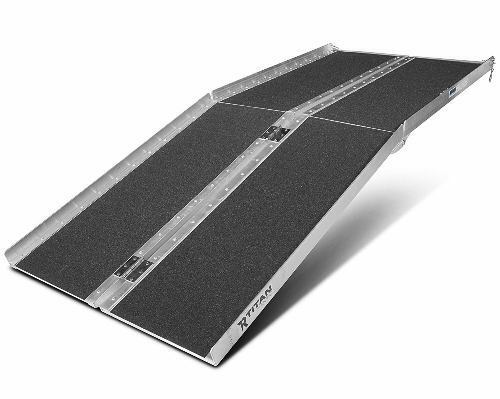 This ramp is lightweight yet strong because it is made of glass-reinforced graphite fiber. You can choose from the five different sizes. 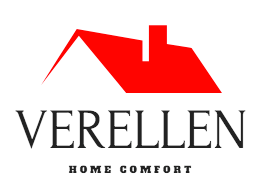 It features a single-fold design. The product is perfect for caregivers and active users. It comes with a folding point for added strength, high visibility lines on the edges for safety and a slip-resistant surface for better traction. The EZ-Access has ergonomic handles that make it portable and handy. The non-breakable, flexible handles have a comfortable and durable grip. It has a slip-resistant coating for better traction in any weather conditions. The folding is protected against the pinching and makes the job of assembling easier. To make sure you will get the right wheelchair ramp for your needs, there are things you need to consider. There are specific building code guidelines for wheelchair ramp length that you need to consider when choosing. According to building code, there should be one foot of ramp for every inch of rise, so if the rise is 9 inches, the ramp length should be around 9 feet. 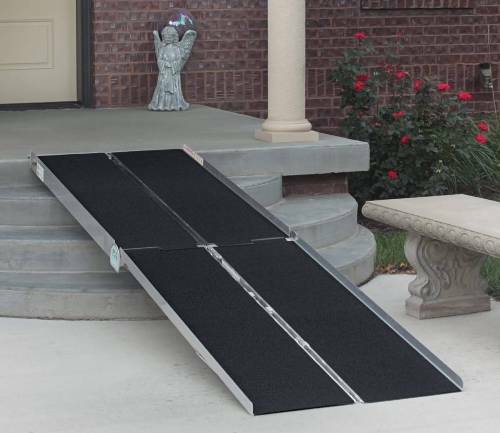 Most portable wheelchair ramp manufacturers suggest one foot of ramp for every 2 inches of rise when the scooter or wheelchair is empty and the ramp is only used for unloading and loading the equipment. It just means that for a 9-inches rise a four and a half foot ramp is enough for a wheelchair with a user and a three-foot ramp is perfect if the chair is empty. It does not matter what the ramp makers or building code say, the longer the ramp, the safer and easier it will be. Even if one foot of ramp for every inch of rise seems like a good slope, it can be very challenging for a wheelchair user if it is long. Those who are using a manual wheelchair will have a hard time using one foot long for every two inches of rise. The weight capacity of a wheelchair ramp is vital to the user's safety. If the user exceed the maximum weight capacity of a portable wheelchair ramp for stairs, it will result in accidents and ramp failure. When deciding on the weight capacity of the ramp, you need to take into account the weight of the user and the wheelchair. For those who are using manual wheelchairs, you don’t need to worry that much since it does not weigh more than 50 lbs. and most ramp can accommodate up to 600 lbs. Scooters and power wheelchairs may exceed the mobility ramps weight capacities. Power wheelchair manufacturers often include the weight of their products, however they often do not include the weight of the batteries and other accessories added to the wheelchair. A power wheelchair that weighs 300 pounds will weigh around 375 to 400 pounds after added accessories and batteries. If you add on the user's weight and the recline or tilt on it, the total weight will be around 600 to 700 pounds. To know the actual weight of the power wheelchair, it is best to have it weighed. It is essential that you need to consider everything that will add weight into it before choosing the wheelchair ramp. After determining the length and weight of a wheelchair ramp, the next thing you need to decide on is the type of the ramp. 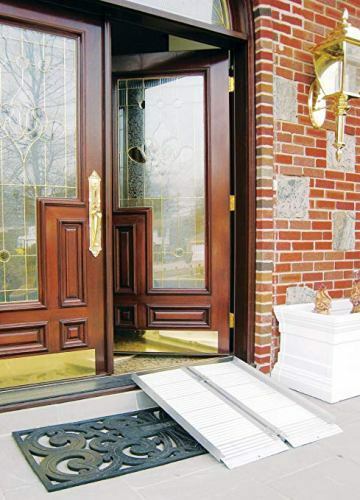 This type of ramp is used primarily for doorway, but it can be used anywhere with a low rise that needs to be climbed. Portability is not an issue as it is purchased for a particular location, but they can be transferred around if required. This type of ramp is lightweight and is easy to set up, carried, transported and used. It does not require a bigger space when storing but since the maximum length is 6 feet they are not recommended for fairly low rises. Those who are using a smaller power wheelchair and manual wheelchairs can use the suitcase ramp. It is recommended for those that require longer ramp but still after for portability. 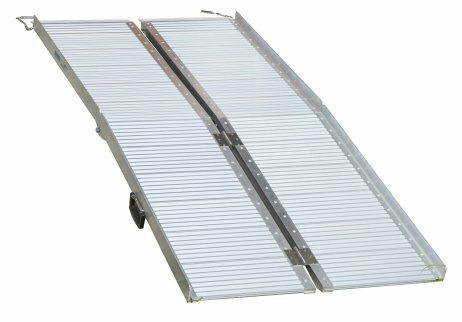 This ramp is available in lengths up to 12 feet long, and the weight capacities are between 600 and 800 pounds. If you are after ease of setting up and use, this is not for you because it is usually folded side to side and lengthwise. This type of ramp is also quite heavy to transport and work with because of its size. This type of ramp is lightweight depending on its length. It is available up to 12 feet and can accommodate up to 600 pounds. Setting up this ramp is not easy since it requires to be parallel to each other. The distance apart is also necessary. If you are after portability, then this is not the right ramp for you. They need to be welded on site and are usually longer and heavier to move. 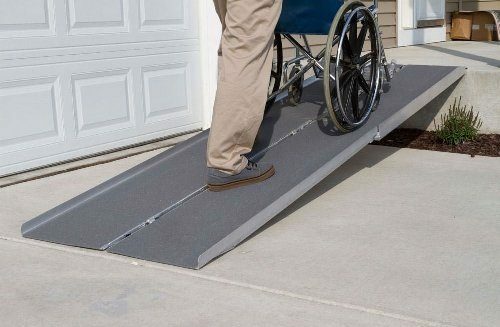 It is recommended for areas where it does not require a permanent ramp but need to be used for a given period. 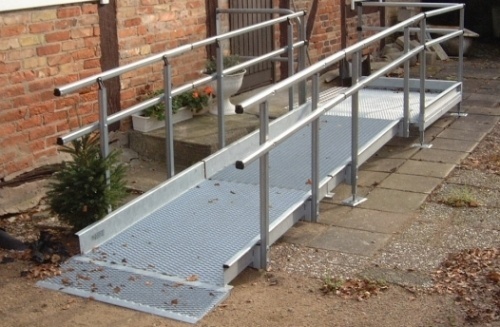 The modular ramp can be purchased with interim landings 90, and 180 degree turns if required and it also has handrails on both sides. 1.Are wheelchair ramps covered by Medicare? Wheelchair ramps are not covered by Medicare unless they are specified as mandatory by a licensed physician. 2.What is the proper slope for a wheelchair ramp? A proper slope for a wheelchair ramp is 1:12 according to ADA. The slope is considered as ideal for all wheelchairs and scooters. More information on this can be found here. 3. Can you rent handicap ramps? You can rent a handicap ramp if you need to use it for 6 months or less. This is known as the best and the most affordable alternative of them all. 4.What is the maximum allowable slope for a ramp? The maximum allowable slope for a ramp is 1:12 without any exceptions. This is a mandatory criteria that must be met. 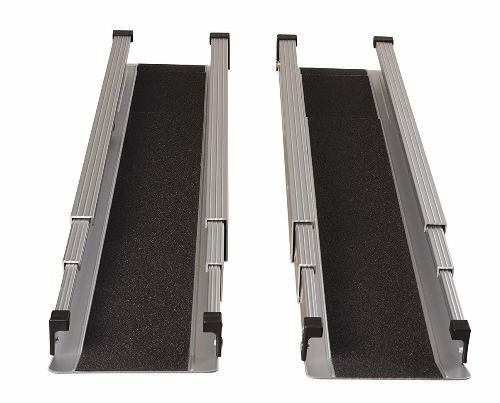 After reviewing top 10 best wheelchair ramps for stairs, we found that Prairie View Industries WCR630 Portable Multi-fold Ramp as the best among the rest. 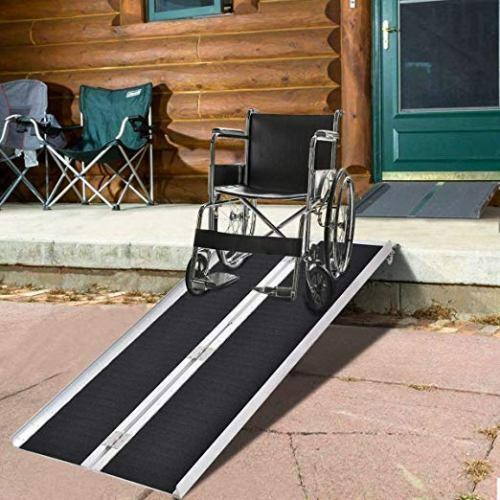 It possesses all the features you need for a wheelchair ramp. Therefore, we would rate this product a 4.8 stars out of possible 5. If you find this buying guide helpful to you, feel free to share it with others.